Travel to the home of the tango and get to know the elegant neighbourhoods of Buenos Aires. Fall in love with nature at the mighty Iguazu Falls and from the mountain towns of Salta & Purmamarca be amazed by the rainbow mountains of the Quebrada de Humahuaca valley. Discover Patagonia in El Calafate and visit the famous Perito Moreno, one of the largest glaciers in the world. International flights: US - Buenos Aires - US. Train to the Devils Throat waterfall. * Documentation of the internal flights will be available in the "My bookings" section in your "Customer Area" 7 days after you have made your booking. Internal flights have a 15kg luggage allowance. It is essential to fill in the passport information correctly for each passenger in the given boxes at the end of the reservations process. It is mandatory to send a copy of the valid passports of all passengers to customerservice@exoticca.com once you have made your reservation. Tourist Tax (Ecotasa). National Park Entrance Fees - approximately $36, drinks, tips and anything not mentioned in the Price Includes section. Arrive in Buenos Aires, a sprawling city, full of colonial architecture and vibrant culture. Spend the day getting to know this exciting city at your leisure. Overnight in Buenos Aires. Breakfast at the hotel. Spend the day on an included tour exploring the charming corners of the city. The city is known as the birthplace of the Tango. Explore the contrasting neighborhoods: the colorful houses of La Boca, the culture of La Recoleta, the old town, San Telmo or the young, vibrant neighborhood of Puerto Madero. We recommend an optional dinner & dance show in the evening. *Overnight stay at the hotel in Buenos Aires. Breakfast at the hotel. Enjoy a day at your leisure, revisiting your favorite spots in the city or discovering the fantastic shopping opportunities. We recommend an optional excursion to the Tiger Delta to see the city from a different perspective. * Overnight in Buenos Aires. Breakfast at the hotel. Transfer to the airport for flight to Iguazu, home of the mighty Iguazu Falls! Take the day at your leisure and if the arrival time allows, we suggest enjoying a bike ride through the jungle or rest in this beautiful natural setting. Overnight in Iguazu. Breakfast at the hotel. Enjoy a tour on the Argentinian side of the Iguazu Falls. Discover one of the greatest creations of Mother Nature from the green train which transports you to two trails. Start on the upper trail following a 1/2 mile of suspended walkways and a view of the falls from above. Then continue to the lower trail and discover the suspended footbridges alongside the falls. We recommend an optional Adventure Tour to get up close to the waterfalls. *Overnight stay in Iguazu. Breakfast at the hotel. Take an included excursion to the waterfalls on the Brazilian side of the border for a different perspective of this wonder of nature and for a chance to see some unforgettable panoramic views of the thundering falls and the lush landscapes that surround them. Return to the Argentinian side for your overnight stay. Breakfast at the hotel. At the indicated time, transfer to the airport for a flight to Salta. Salta is located in the Lerna Valley, in the northwest of the country. Arrive, transfer to the hotel and overnight stay in Salta. Breakfast at the hotel. Enjoy a full day excursion through the Lerma Valley. Explore the village of El Carril, and continue through the Quebrada de Escoipe, a narrow valley of deep green surrounded by mountains, until you reach the wonderful Cuesta del Obispo. Enjoy panoramic views of Valley Encantado. The highest point is reached at Piedra del Molino at 10,985 feet above sea level. Cross the Strait of Tin-Tin, and the Cardones National Park. Arrive in Cachi and enjoy incredible views of the Nevado de Cachi and Payogasta. You will have free time to visit this colonial-style town and visit the local church, one of the oldest in the region. Return to Salta for an overnight stay. Breakfast at the hotel. Explore the region by 4x4 and visit Tastil, a sacred city of Inca origin; San Antonio de Los Cobres and the Grand Salares salt fields. Next, descend to the Valleys of the Quebrada de Humahuaca. At the foot of the Hill of the Seven Colors, arrive in the town square of Purmamarca an aboriginal artisan production center. Overnight stay in Purmamarca. Breakfast at the hotel. Continue your trip through the Quebrada de Humahuaca by 4x4 vehicle. Departing from Purmamarca, pass through the Posta de Hornillos until you reach the town of Tilcara. Continue to Huacalera and the Tropic of Capricorn pass, from where you can see the vibrant colors of the Pollera de la Colla hill. In Uquía visit a local Church, which is famed for its paintings of the Arcabuceros Angels. Finally, arrive in Humahuaca and visit the Cathedral and the Monument to the Independence, made by the sculptor Soto Avendaño. Head back to Salta. Overnight stay in Salta. Breakfast at the hotel. Transfer to the airport for a flight to Calafate, a town near the edge of the unique region of Southern Patagonia, and home to the huge Perito Moreno glacier. Spend the day at your leisure exploring the town and sampling the unique cuisine of this other-worldly region. Overnight in Calafate. Breakfast at the hotel. Journey to Perito Moreno, the most famous glacier in the world. On arrival, enjoy an included tour of the Glacier National Park and view Lake Argentino, Argentina´s biggest freshwater on a Nautical Safari. From here it is possible to contemplate the beauty of Perito Moreno. Stroll along the walkways in front of the glacier to see this spectacular ice mass from different perspectives. Return to El Calafate and overnight in hotel. Breakfast at the hotel. Free day to enjoy the surroundings or do some shopping. Alternatively, we recommend an optional Glacier cruise Maria Turquesa. Overnight in El Calafate. Breakfast at the hotel. 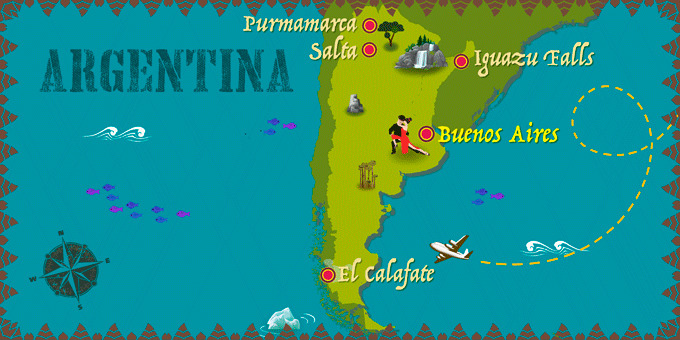 At the indicated time, transfer to the airport to board a flight to Buenos Aires. Depending on your arrival time, spend the afternoon further discovering the vibrant capital. Overnight in Buenos Aires. 16th Day: Buenos Aires - U.S.
*Depending on your departure time, you may arrive back in the U.S. the following day. Passport must be valid at time of entry. One passport page required. No visa is required to enter the country if you are staying less than 90 days. 220 V. UK and European plug. Depending on the area of the country that you plan to visit, vaccinations against yellow fever may be mandatory. Consult your doctor. 35% 60 days before departure. International flights: U.S. - Buenos Aires - U.S. Tourist Tax (Ecotasa). National Park Entrance Fees - approximately $19, drinks, tips and anything not mentioned in the Price Includes section.